Don't get frustrated like that guy! We have all had this happen. 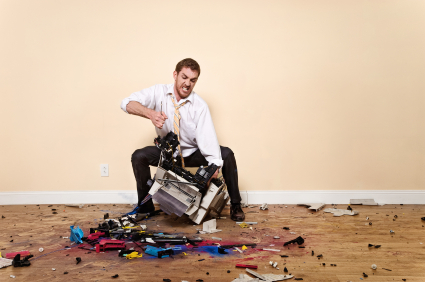 Just when you need to print an important document, or want to scan that picture someone gave you, or just need to fax something, your multi-function printer goes out of order. Maybe you forgot to buy ink, your child poured chocolate milk in your printer, or worse, the unintelligble message on the printer that is meaningless, and it just won't work. Bring a flash drive with you, or have an email address that you can access over the Internet. Scanning start at $1.00 per page, and volume discounts apply. Now, you can print from ANY WHERE with eprinting. Just give us a call, and we will tell you where to email your print job, or where to print on your smart device. Bring your flash drive, or have an email address that you can access over the Internet. Printing start at 0.250¢ per page, and volume discounts apply. Need to have copies fast, but don't want to wait in line at Kinko's? Jenny's Postal Services has a fast color printer that will make your copying needs quick and painless. Copying start at 0.250¢ per page, and volume discounts apply. Located in Western Glendale, near Burbank, serving Glendale, Burbank, Pasadena, Montrose, La Canada, Hollywood and Los Angeles. Prices are subject to change without notice. Please contact Jenny's Postal Services for current costs. Jenny's Postal Services is part of Jenny's Family of services. Please visit Apostille Notary Glendale, and be sure and make a donation to the Glendale Community Senior Services Center, which is partially funded by Jenny's Postal Services. Jenny's Postal Services is an equal opportunity employer and provider. Jenny's Postal Services is not a law firm, and its agents are not attorneys. Please contact a licensed attorney or your local bar association for all legal matters. Copyright © 2010 - 2019 Jenny's Postal Services. All Rights Reserved.